Investing is hard. You, like many others, probably watch financial TV networks, read analysis, listen to talk shows and talk to fellow investors, trying to understand what's next. One popular stock market "indicator" is interest rates. Analysts parse every word from the Fed, hoping they hear a clue about interest rates. 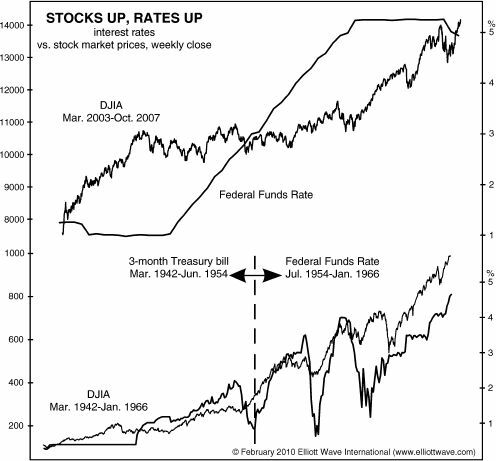 They assume that falling rates means higher stock prices, while rising rates means lower stocks. But does the conventional wisdom about interest rates and stocks square with reality? Let's do a brief historical review. From October 1974 to December 1976, the stock market rose as the Fed funds rates trended lower. This occurred again from July 1984 to August 1987. Conversely, stock prices faltered as interest rates climbed from January 1973 to October 1974 and again from December 1976 to February 1978. So far, so good: rates up/stocks down, or vice versa. 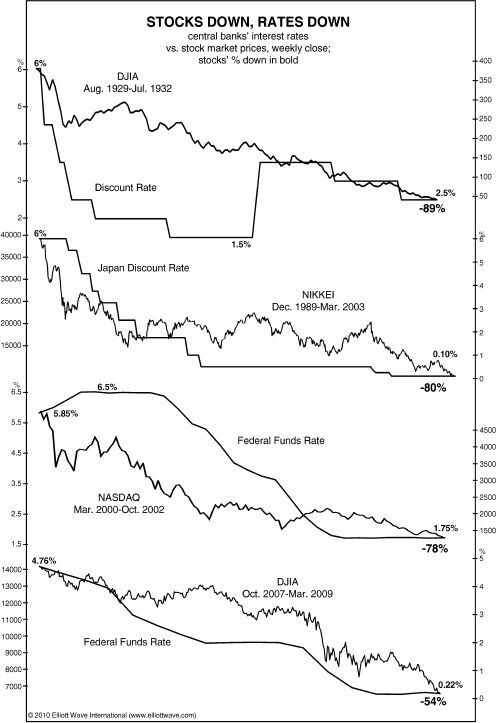 [The chart] shows a history of the four biggest stock market declines of the past hundred years. They display routs of 54% to 89%. In all these cases, interest rates fell, and in two of those cases they went all the way to zero! The next chart shows you when stocks and interest rates trended higher together. You can see the Dow rise from March 2003 to October 2007 as rates climb from around 1% to over 5%. Here's the point: There is no consistent relationship between interest rates and the stock market. The Fed's decision will not cause any such volatility; it just may (or may not) coincide with it. Whether volatility continues around the Fed's meeting is up to the markets, not the Fed... [The] Fed's meeting, therefore, is not crucial, pivotal, historic or momentous. It is mostly irrelevant. Investing is hard, but believing in the myth that interest rates have a big influence on the stock market makes it even harder. And, we have several more popular myths to dispel for you in our free report, Market Myths Exposed. This article was syndicated by Elliott Wave International and was originally published under the headline Will the Fed’s Rate Hikes Choke the Stock Market Rally?. EWI is the world's largest market forecasting firm. Its staff of full-time analysts led by Chartered Market Technician Robert Prechter provides 24-hour-a-day market analysis to institutional and private investors around the world.